Join the thousands of recording studios that already use it. Works in almost any DAW. Available in VST2, VST3, AU and AAX plugin formats, Windows and macOS operating systems. Helps you comply with strict loudness requirements for the Film and TV industry. Helps you get the correct loudness levels for upload to Spotify, YouTube, Apple Music and Tidal. Prevent your mix sounding crushed and unprofessional. Get the most out of your mix, make any track sound great on all streaming platforms! Youlean Loudness Meter was the winner of KVR Developer Challenge 2016. As one of the prizes, the plugin was presented on NAMM Show 2017 in Los Angeles. Youlean (Julijan Nikolic) is also part of the FL Studio alpha team, and many of his work like Patcher presets and ZGameEditor Visualizer effects are already part of the FL Studio. Find out what regulation your country is using and use ITU-R BS.1770-4, EBU R128, ATSC A/85, OP-59, ARIB TR-B32 or AGCOM 219/09/CSP preset to comply with the standard. Make sure to sound great on Spotify, YouTube, Apple Music, Tidal or when streaming by using AES loudness preset. GUI too small or too large? No problem, freely resize or scale the plugin! Experience insane plugin size customization. If you find graphs too distracting you can always switch to mini mode. Fit precisely for your workflow. Inspect what exactly is going on with the audio dynamic. 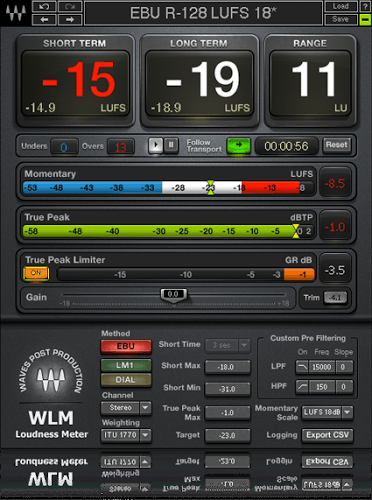 Using the peak to short-term loudness algorithm you can detect squashed or not correctly compressed mix. Easily export PDF of all your measurements. In combination with system time coding, pinpoint the loudness problems in live events, or just make a wall poster of your favorite song! The plugin is calibrated and tested against ITU-R BS2217 testing materials. It satisfies all requirements defined in ITU-R BS.1770 document.